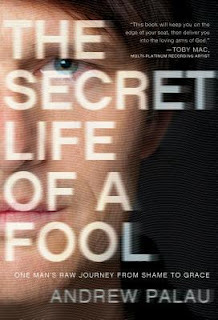 Secret Life of a Fool : One Man's Raw Journey from Shame to Grace, by Andrew Palau is a story of redemption and grace. Andrew Palau is the formerly wayward son of evangelist Luis Palau (who I really do not know anything about) turned committed Christian and evangelist in his own right. (I also want to provide the disclaimer that I am completely unfamiliar with Andrew's ministry. I reserve the right to disagree with his ministry and/or specific theology upon closer inspection of it.) For the moment though, as it relates to this book, I have no reason not to recommend it. It is a story of the power of the cross. Andrew Palau was raised in a Christian home and has nothing but praise and respect to heap upon his parents' heads as he describes his behaviors and their reactions to it as he was growing up. He felt incredibly loved and supported by his parents even though he knew he was acting out of line with their belief system. Most of the pages within this book contain a confession of Andrew's bad behaviors and attitudes and how he lived out his rejection of Jesus Christ up until his mid-20's. The story is not exactly pretty, although Andrew does the reader the appreciated favor of being discrete in most of his retellings. We are made aware of his drug use and attitude towards women, but he is not lurid in the detail. Mostly he focuses on describing his heart attitude during his "rebellious years." I particularly have no hesitations in referring this book to any reader because Andrew Palau goes to great pains to avoid excuses for his past behaviors. He doesn't try to shift blame for any of his sins; he confesses and owns that his mistakes were entirely his own, made from a prideful and sinful heart. Palau is brazenly honest about owning his own sins and for this I have great respect for the man. The majority of Secret Life of a Fool , in fact, deals with Andrew Palau's life pre-salvation. The story is gritty and real. He was deeply involved in drugs and just reading about this is disturbing to me. (I have a feeling that someone who is pursuing the same life of destruction will be able to connect to Palau's words as they read along.) Only towards the end of the book does the reader find the satisfaction of knowing that Palau ultimately surrenders his life to Christ. Not even then does Palau make the story sound prettier than it really was. Once again, Palau was heavily steeped in a world of parties and drugs and it was hard to remove himself from his and focus on Christ. He acknowledges the struggle not just for the sake of being honest (although that is hugely appreciated) but to offer the reader hope for their own lives, should they also be struggling against addictions. I am very thankful to Worthy Publishing for sending me a copy. I am even more pleased to inform you that they have offered THREE copies of Secret Life of a Fool to give away to THREE Reading to Know readers. To enter? Simply leave a comment below (and include a valid e-mail address!) This contest is open to US Residents only and will be open through Tuesday, April 10th. THIS CONTEST IS NOW CLOSED. THE WINNERS, as selected by Random.org, ARE #9 - clp, #15- Nancye, and #17 - AmandaSue. They have all been contacted. Congratulations, ladies! A worthy read from Worthy Publishing. Thanks, guys! I hadn't heard of Worthy Publishers...just spent some time visiting their site. This book sounds like a solid, realistic read...though not refreshing until the end. Count me in! I actually work for another evangelistic association so I have heard about Andrew's story but dont' actually know much about it. I am very familiar with Luis P. so I am curious about his son's experience. Thanks! As the step-mother of an adult son who has rejected God, I would appreciate reading this. I would love to read this book and share it with my friends after I'm done! After hearing Andrew on the radio talking about his book I knew my 17 year old son needed to read this. I've just read it and enjoyed it. I'd heard Luis Palau preach so I wanted to know more about his son. I liked that he seemed so ordinary, like anybody else's son. Felt like a book that would give a mother hope. I enjoyed your review too. I am somewhat familiar with Luis Palau's ministry. Would appreciate reading about his son's coversion. (Reminds me of Franklin Graham). Please enter me. I remember the Palau family from when I lived in Portland. I'd be interested to read this. This sounds like a very interesting book. Thanks for the giveaway! This sounds fabulous. It makes a person wonder who his testimony might reach since he is "keeping it real".